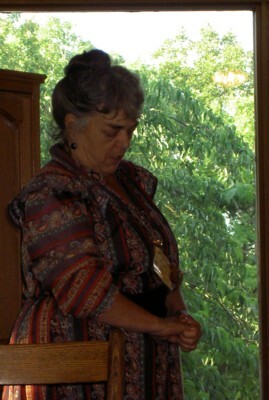 Marion, the Elder Hostel Interpreter. No. She isn't praying for strength. 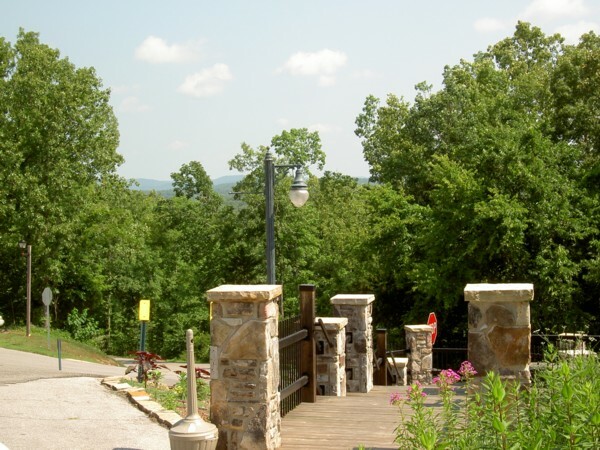 We left Springdale at noon and after a three-hour drive across the winding mountain roads of north Arkansas, we reached Mountain View and the Ozark Folk Center State Park. We checked in and unloaded our things in our little duplex cabin. We went to the restaurant and checked in with the Elder Hostel interpreter. and met my cousin and his wife. We waited in the restaurant and talked with the guide while we for supper at five. It was a great supper of fried chicken, mashed potatoes and gravy, corn, and green beans. After we ate we introduced our selves. There were teachers, school counselors and administrators, engineers, architects, a doctor, a geneticist, a pharmacist, and others I may have forgotten. It is a very interesting group. Many are retired, but others are still working. We and another lady are from Texas but most were from the northern mid-west. There are nine couples and nine individuals. After supper they took us to the Jimmy Driftwood Barn for a country music program. Most of the singers and players were experienced amateurs; perhaps a few of them occasionally play for pay. Several had recorded music for sale. The performance was free for a donation (they passed the ‘plate’) and there were some great country songs and some great performances. 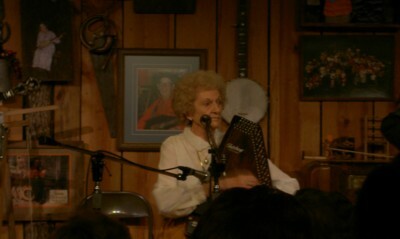 Several women played the autoharp. This woman sang in a beautiful, high, country soprano. She didn't smile; that seems to be the way to do country music. The lead photo shows the Jimmy Driftwood Barn stage pretty well. The featured performer there is the old fellow in the overalls and cap. He is 91 years old and a great harmonic player. The others did their own solos and groups performances at other times. The fellow in the red shirt plan the washtub bass was the MC. The woman in the pink shirt on the right was doing a clog dance. 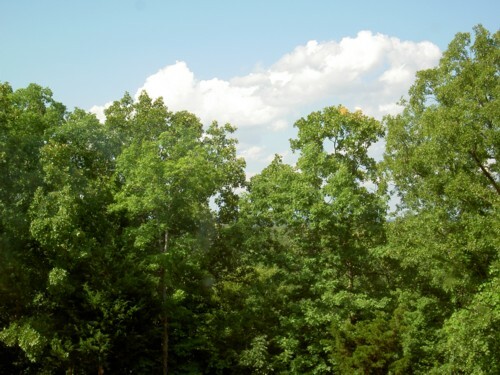 This is a beautiful natural setting, but all you can see are clouds and trees. I don't think there is any place from which the surrounding mountains and valleys are visible. 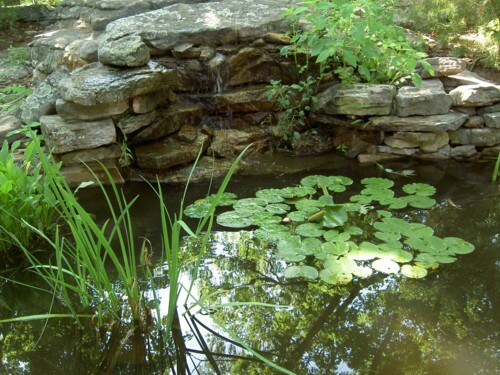 There is a rugged, natural beauty to the area although this fountain is artificial. There are gold fish in the pool and squirrels and a variety of birds in the trees. The trail down hill from the Skillet Restaurant to the Lodge Rooms shows some of the rugged mountain beauty. The trail was about a quarter of a mile long and steep, although the switch-backs made the descents and ascents easier. I only walked up the trail one time. It was in the middle of the afternoon and that was enough for me. The walk down hill wasn't bad. The distant mountain horizon is visible from the top of the steps leading up to the administration building across the circle drive from the Skillet restaurant..
Day 1 - Refreshments and Get Acquainted. Announcements and Introductions. Jimmy Driftwood Barn music show. Day 2 - Folk Center history and Ozark Lifestyles. Blanchard Caverns and Springs Tour. "Charles Kelly, Sheriff of Indenpendence County"
Day 4 - "Long Walk Home" Jimmie Edwards relives an Arkansas Confederate Soldier's time in the Civil War. 1890s Parlor Party with the Brysons. Visit to the craft center. Ozark Folk Center country music program. Day 5 - Tomahawk throw and history with Scott Reidy. Craft center visit. Signs and Superstitions with Deb Redden. Learning country games and dances with Mary Gillihan. The Herbin' League. More country music. Day 6 - "This Ain't No Devil's Box" with Danny Thomas as "Gus Pike." Graduation. 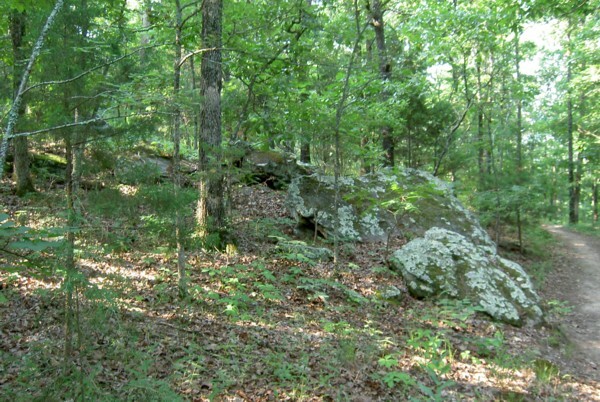 Then we visited Oil Trough, Arkansas, on the bank of the White River. The Ozark Folk Center - Find more infromation about the folk center here. Elderhostel - Find more infromation about Elderhostel here.